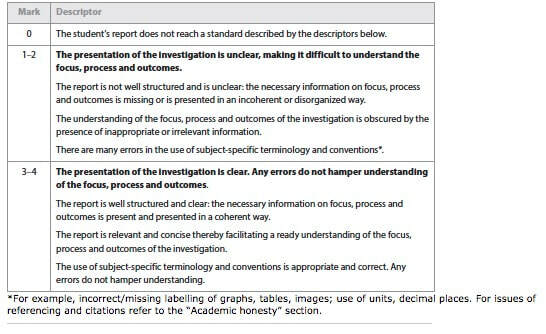 This criterion assesses whether the investigation is presented and reported in a way that supports effective communication of the focus, process and outcomes. A consistent linguistic style is maintained throughout the writing. No spelling or grammar errors are present. Written in past tense with good paragraph structure. Legible font style and size are used. Use of color in images or graphs is appropriate. Citations given for all material taken from sources. There are clear headings for each section, with consistent formatting. Graphs, tables, images sequentially titled (i.e. “Figure 1…”). Graphs, tables and images included as close as possible to its first reference. Tables and graphs do not break across pages. Parenthetical in-text references/citations are given in consistent format. A Works Cited List with consistent formatting is given at the end of the report. Sources are written in alphabetical order by author’s last name. Paper is 6-12 pages in length. All data, graphs and images are relevant to the RQ. All citations are relevant to the RQ. All analysis and discussion are relevant to the RQ. Tables are well organized, with specific and clear title, headings and units. Table column headers are present and correct (MV in first column). Graphs are well organized, with specific and clear titles, labeled axis (with unit) and appropriately scaled axis. Images annotated with captions to add information of value to the investigation. Avoid excessive use of jargon. Non-standard technical terms are explained and used in the correct context.